Will this book help us? 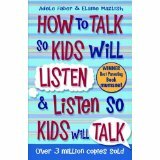 So here are are onto Chapter 2 of ‘How to Talk so kids will listen’; ‘Engaging Cooperation’. With a 7yo Curly Headed Boy and soon to be 3yo Little Dimples, life has become a little shouty of late and we were looking for some alternative options, as being stricter wasn’t cutting it. So I decided to read, review and test out some books on my blog and last week was Ch1 of this fab book. By now the kids are meant to be feeling more listened to, and therefore be opening up to us. They will also be better at finding their own solutions to their problems. (I’ll let you know how we are finding it at the end of the reviews in a few weeks). i.e. getting the little blighters to do what you want them to do! 1) Blaming and accusing e.g. ‘How many times do we have to tell you not to wind up your sister when she is tired, are you just looking for trouble’; yep we are guilty of this one and there is way too much blame going on in this house. It’s like a viscious circle. 2) Name Calling e.g. ‘How stupid can you be to do that again’; this I had a lot of as a child and really hate it as anyone who tries it on my kids quickly finds out. 3) Threats e.g. ‘If you keep doing that we will take away your toys’. We’ve been trying the threat thing and it basically doesn’t work for us at all. 4) Commands e.g. ‘Hurry up and put your clothes away right now!’; we tend to be pretty polite in this house, but once it’s been asked once I get irritated, that’s for sure. 5) Lecturing and Moralising; basically a long description on why they shouldn’t do stuff that would bore anyone to tears. 6) Warnings e.g. ‘Be careful’ repeated over and over, which is an easy trap to fall into. 7) Martyrdom statement e.g. ‘Will you stop all that noise, you are giving me a headache!’. I have to be really careful of this and that the kids don’t think my Fibromyalgia is there fault. 8) Comparisons e.g. ‘Your 3yo sister has better table manners than you’. We aren’t too bad at this one luckily, but it is tempting! 10) Prophecy e.g. ‘Those cats are not going to be your friend if you keep chasing them Little Dimples’. Actually, the cats seem to be pretty forgiving, especially for a treat. So here are the tips they give for what to do instead, I must admit some of them are great, time saving, and really easy to do. 1) Describe what you see or describe the problem e.g. ‘Your Pyjamas are on the floor’. 2) Give information: e.g. ‘If they aren’t put in the washing basket they miss getting washed’. 3) Say it with a word: e.g. ‘PJ’s’; THIS TIP IS PURE GENIOUS!!! 4) Describe what you feel: ‘I feel unappreciated sometimes when it seems that clean clothes are taken for granted’. This one is tricky because we need to avoid the word ‘you’ in order for it to not be blaming or accusing e.g. “When you leave your PJ’s all over the floor I feel unappreciated, will you never learn?”. 5) Write a note: e.g.on a yellow sticky on the wall by the basket (I have got monster HUGE yellow stickies!). We’ve had a quick play with these ideas, but will focus on them a lot more this week, my favourite’s so far are (1) and (3). I think that for us the most difficult is changing from being polite and then getting angry, to being more direct and talking about how we feel before we blow up. They have a good tip about the word ‘Please’; funnily enough I’ve been saying to the big Hairy Northern one that he says please a lot to the kids when asking them to do something. I suggested to say ‘please’ first time only. They say not to use it at all, because when we think we’ve taken the time to be polite and the kids still ignore us, it leads to us feeling more angry. They suggest you just use it for the simple little things like ‘Please pass the ketchup’. Another tip is to make sure that the request is suitable for the kids age, reasonable and that we give them the flexibility as to when and how to do it. It can be easy to want them to do something or not do something just because we are tired and grumpy, than for any real reason. They also remind us to be really careful of the word ‘You’, which I talked about a lot in my old post about ‘do we teach people how to treat you‘ that you might want to read for more ideas on how to describe how you feel. Remember, you aren’t trying to be constantly patient and calm; it’s fine to be angry, just not to use words that will hurt our kids and make them shrink. I’d love to hear what you think. Or other books you think I could review? If you’ve written a blog post about this book, let me know in the comments and I will put a link to it in my final review. Why I started reading the book. Do we have a bad habit of confusing our kids so they don’t know what they are feeling? Do we really need a separate Camera from our phone camera? Thanks for sharing this, it’s really made me think about the way I interact with my children of 8 and 6. At the moment I seem to be constantly ‘nagging’ my whole family, including my other half. How have I turned into this person??? I don’t like it! However, now it’s a little clearer to me that I am indeed ‘Blaming and Accusing’, using ‘Threats’ and certainly my favourite seems to be ‘Comparisions’ without even realising. The simple 5 steps they suggest you take instead are now firmly placed in my diary to refer back too. Here’s hoping for more success and peace in my household. Let me know how it goes @Mags and keep an eye on my blog for the summaries of the next chapters. It’s so tiring all that nagging isn’t it? I think that it gradually happens to us all. The great thing is that you’ve noticed it – many people don’t. I love any excuse for stationary of any kind @suzanne! Dirty clothes on the floor -> I’m so with you on that one!! !